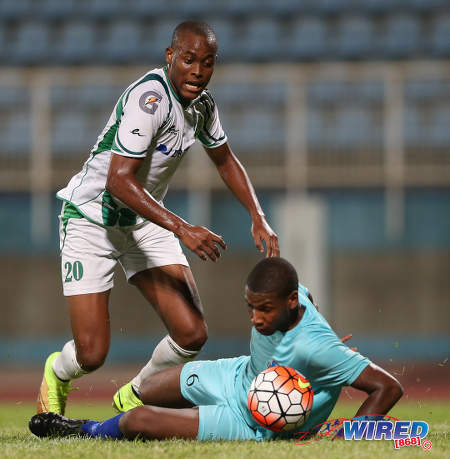 DIRECTV W Connection started their quest for an eight CONCACAF Champions League appearance with a hard earned 4-2 victory over Dominican Republic’s Atlantico FC at the Ato Boldon stadium last night. 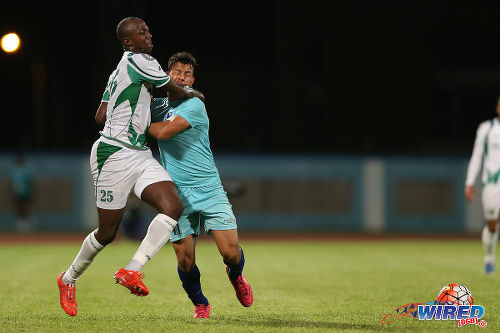 Photo: W Connection defender Daneil Cyrus (left) tangles with Atlantico FC flanker Adrian De Jesus in Caribbean Club Championship action last night in Couva. 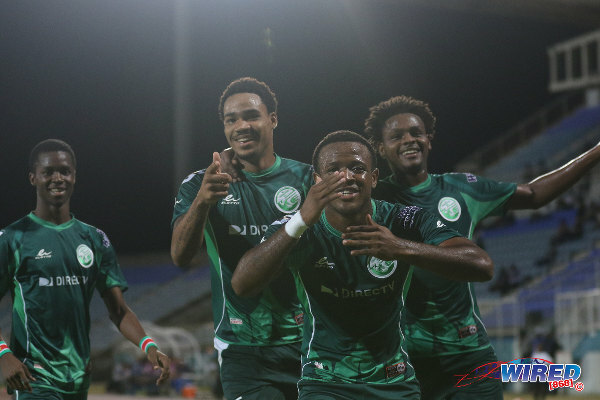 Double strikes by attackers Jomal Williams and Jamal Charles secured an important three points for Connection after last year’s CFU Club Championship runner’s-up twice trailed a gritty Atlantico outfit. On Tuesday night, former Connection standout Joevin Jones played his first competitive match for his new club Seattle Sounders FC in a Champions League quarter-final first leg clash with Mexico’s Club America. 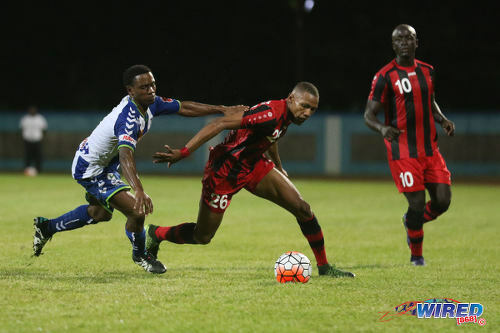 Jones’ former Connection teammates can’t start thinking of facing the likes of America or Sounders just yet though, as the “Savonetta Boys” had their hands filled with the aggressive, hard pressing Atlantico team in Couva last night. “Starting off with a win was very important but in saying that we are a bit disappointed in our team performance because we thought our team lost the shape and didn’t play the way we wanted,” said Connection assistant coach Earl Jean. 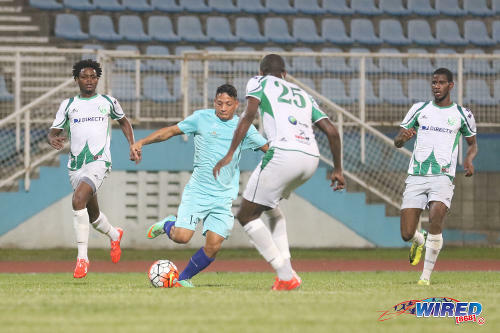 Photo: Atlantico FC attacker Leinner Chirinos (centre) takes on W Connection players (from right) Kurt Frederick, Daneil Cyrus and Triston Hodge during 2016 Caribbean Club Championship action last night in Couva. Maybe the visitors were a bit too aggressive though, as both Mateo Ortiz and Nelson Areco were ejected in the second half. 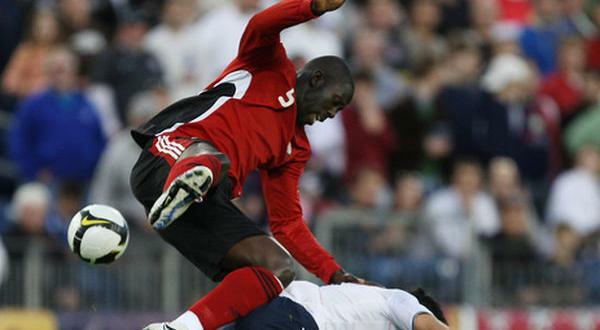 Connection were no saints themselves, as attacker Shahdon Winchester also saw red from St Lucian referee Leo Clarke for his role in a scuffle with Ortiz, shortly after the resumption. Only the winner of the four CFU Club Championship groups advance to the semi-final round. 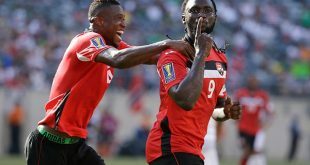 From there, the top three finishers will go on to represent the Caribbean at CONCACAF level. 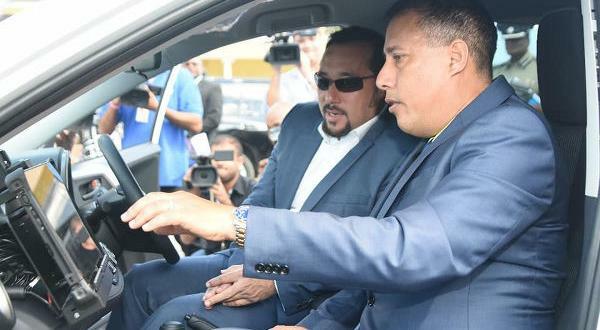 Connection and Atlantico were eager to rise to the occasion then, and they both engineered chances from free kicks inside the first ten minutes. Connection skipper Alvin Jones struck the base of the post with his long range effort in the fourth minute. But it was the visitors who prospered from the dead ball, as the combative Areco rifled a left-footed volley past Connection goalkeeper Julani Archibald from close range following a Wuiswell Fernandez delivery three minutes later. 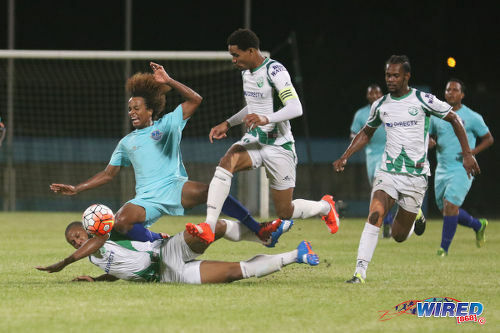 Photo: Atlantico FC winger Bryan Gonzalez (second from left) is chopped down by a tackle from W Connection midfielder Briel Thomas (left) while Gerard Williams (far right) and Alvin Jones look on during 2016 Caribbean Club Championship action last night in Couva. 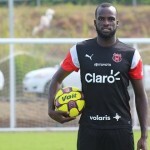 Connection, who failed to get clearance to use Trinidad and Tobago international midfielder Hughtun Hector, struck the woodwork again in the 14th minute, as Dominican midfielder Briel Thomas hit the crossbar with a thunderous drive from just outside the area, after a flowing left side move. But Atlantico made things difficult for Connection, as they maintained a rigid shape while implementing a high-pressing game. Connection did some probing and pressing of their own though, and only a last-ditch interception by Areco thwarted Williams from having a crack at goal from point-blank range in the 29th minute. But Areco and his goalkeeper Tim Pallaks were hapless to stop the wily Williams, just three minutes later, as the attacker bundled in a low, slippery cross from left-back Kurt Frederick. Photo: W Connection attacker Jomal Williams (centre) reacts to the action during 2016 Caribbean Club Championship football last night in Couva. Williams was in the thick of the action again, just after the restart, as his marker went down clutching his face on the left flank. While Clarke hurried over to see about the fallen Atlantico player, Ortiz and Winchester decided to share their distaste for each other at the edge of the Atlantico penalty box. 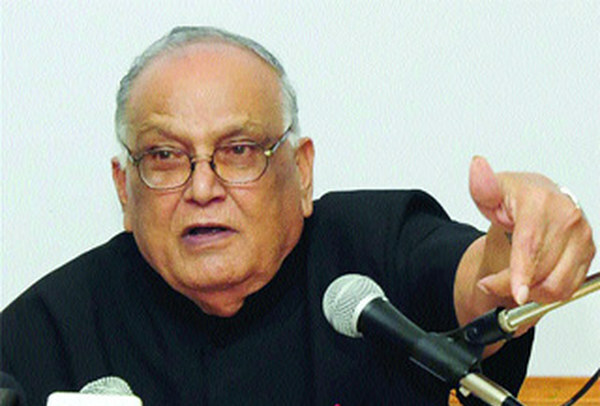 Clarke, after advice from his assistant referee, gave both players their marching orders. 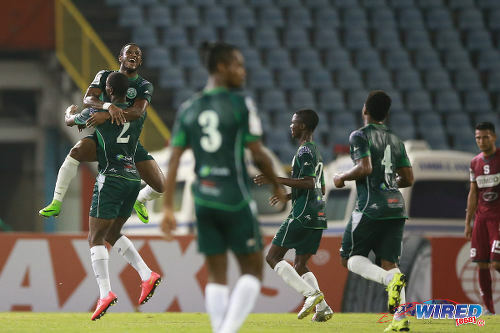 As the game grew increasingly stretched, Atlantico surged into the lead against the run of play in the 65th minute. First half substitute Kerbi Pichardo ghosted through the Connection midfield and picked out teammate Leinner Chirinos at the edge of the box, before sliding Chirinos’ return pass beyond Archibald’s desperate dive. The visitors’ joy was short-lived though as Williams stylishly equalised just three minutes later, although he appeared to be in an offside position when he received a through ball from Connection playmaker Andre Toussaint. Photo: W Connection forward Jamal Charles (left) takes on an Atlantico FC defender during 2016 Caribbean Club Championship action last night in Couva. Substitute Charles then gave Connection their first lead in the 79th minute, as he rounded Balbuena to score after latching on to a lofted Frederick pass. 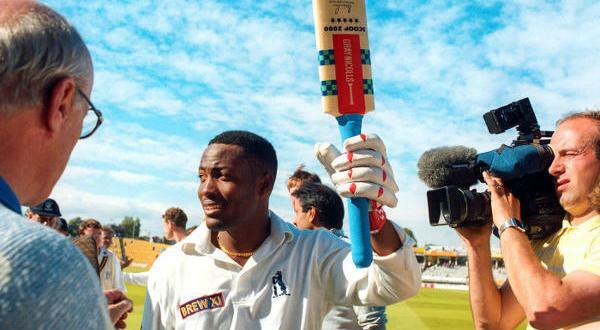 Connection head coach Stuart Charles-Fevrier seemed to be enjoying the excitement a bit too much, as he unconsciously strayed away from his technical area and on to the field of play. Fevrier and his coaching staff were able to rest easy in stoppage time though, as Charles profited from another Frederick pass to score from close range, after an initial save by Balbuena. 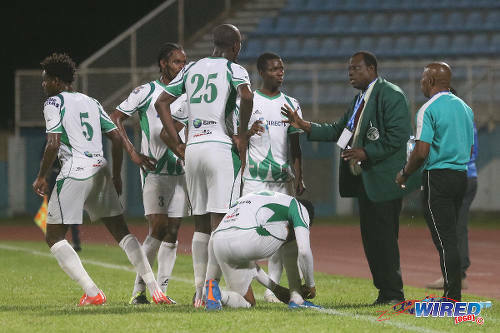 Photo: W Connection coach Stuart Charles-Fevrier (second from right) and assistant coach Earl Jean (far right) speak to their players during a break between the action against Atlantico FC in 2016 Caribbean Club Championship action last night. 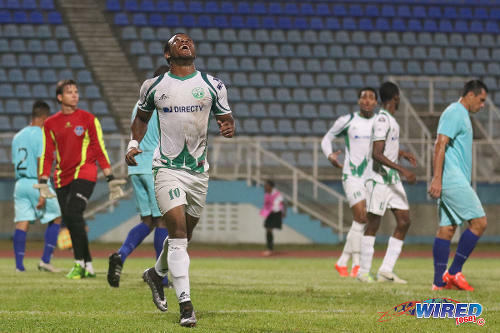 In the first match of the double header, a second half injury time goal by Inter Moengo Tapoe attacker Romeo Kastiel gave the Surinamese club a 3-2 win in a nail-biting contest against Guadeloupe’s Club Sportif Moulien. Kastiel’s goal at the end of the contest capped off a hat-trick for the speedy attacker, after Sportif battled their way back from a two-goal half time deficit. 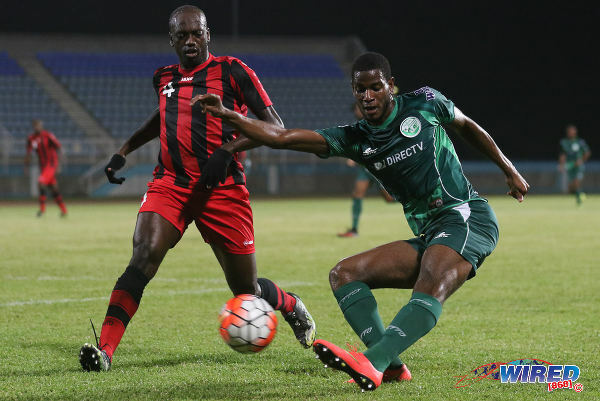 Life is not going to get any easier for the Guadeloupe club though, as they face the host team Connection in their second game tomorrow from 7.45 pm at the same Couva venue. Meanwhile, Inter Moengo Tapoe and Atlantico FC will do battle battle from 5.30 pm. W Connection (4-2-3-1): 18.Julani Archibald (GK); 16.Alvin Jones (captain), 25.Daneil Cyrus, 5.Triston Hodge, 2.Kurt Frederick; 8.Briel Thomas, 3.Gerard Williams; 12.Dimitrie Apai (20.Jamal Charles 69), 14.Andre Toussaint (34.Jabari Mitchell 80), 10.Jomal Williams; 9.Shahdon Winchester [Red card 52]. Unused Substitutes: 1.Terrence Lewis (GK), 4.Maurice Ford, 26.Paolo De La Guardia, 35.Keston Julien, 43.Malik St Prix, 46.Anfernee Frederick. Atlantico FC (4-3-3): 1.Tim Pallaks (GK); 11.Adrian De Jesus, 3.Nelson Areco [Red card 83], 6.Yefri Gonzalez, 2.Eduin Rubio; 23.Cristian Caseres (captain), 4.Mateo Ortiz [Red card 52], 22.Wuiswell Fernandez; 14.Leinner Chirinos, 9.Jose Mendez (10.Kerbi Pichardo 36), 7.Bryan Gonzalez (13.Jose Diaz 87). Unused Substitutes: 12.Nestor Balbuena (GK), 20.Guillermo Martinez. Photo: Inter Moengo Tapoe attacker Stefano Rijssel (centre) turns on a Club Sportif defender during 2016 Caribbean Club Championship action last night in Couva.